Redefining "Life as We Know it"
In 1997, Charles Fisher, professor of biology at Penn State, discovered this remarkable creature living on mounds of methane ice under half a mile of ocean on the floor of the Gulf of Mexico. The flat, pink worms, one or two inches in length, use their appendages like oars to move around the surface of the ice as they graze for the bacteria also living there. The new worm species, Hesiocaeca methanicola, may have some influence on the formation of natural gas deposits on the sea floor and, if so, on how we go about mining gas as a source of energy. It has already helped redefine "life as we know it." The bacteria the ice worms eat, and the methane both species grow on, could provide clues about early life on this and other planets. 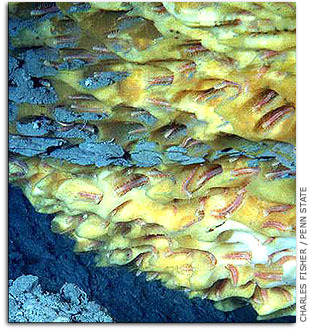 A dense colony of one-to-two inch-long polychaete worms living on and in the surface of the methane hydrate. Fisher came upon the worms by accident while collecting tubeworms near hydrocarbon seeps at the sea floor. Before the discovery, methane ice had been of most interest to geologists and energy companies, not biologists. The area where the ice worms live is under extremely high pressure and, at 7°C, very low temperatures. Adds Fisher, "The ice worm community is in itself a new ecosystem. We found an animal living in an environment that we never thought of as a habitat for animals." The ice was formed when methane gas rose up from deposits deep beneath the sea floor. Ancient bacteria that may have lived beneath the Earth's crust, feeding on this gas, migrated with it, eventually settling on the ice. The ice worms, which are not ancient animals but are related to the common red mud worms we see after a rain, would have come along later. But the mere fact that they can survive such a harsh environment shows the long-term adaptive capabilities some animal species possess. Says Fisher, "The animals we study live in some very extreme, very strange environ-ments and they adapt to it using special physiology, special anatomy, and special behavior." "It's very cool that while we're busy speculating about life on other planets we continue to discover new forms of life in the most unlikely habitats on Earth," commented Erin McMullin, a Penn State graduate student and a member of the research expedition that discovered the methane-ice worms. Methane ice, a gas hydrate, forms naturally at the high pressure and low temperature of the deep sea, but is usually buried deep in marine sediment. The Gulf of Mexico is one of the few places where hydrate can be found exposed on the ocean bottom. Occasionally this seeping, solid methane bursts through in mounds, often six to eight feet across." The Penn State Astrobiology Research Center, directed by Hiroshi Ohmoto, Ph.D., professor of geosciences in the College of Earth and Mineral Sciences, is one of 11 lead members of the NASA Astrobiology Institute. PSARC is affiliated with Penn State's Life Sciences Consortium, the Environment Institute, and the Pennsylvania Space Grant Consortium. For more information, contact PSARC at 814-863-8761, or lxd1@psu.edu, or see http://psarc.geosc.psu.edu.